Brewing companies worldwide come in all shapes and sizes. From multi-national corporations to monasteries, the art of brewing beer has been a driver of economies and a reason for pilgrimages for centuries. In the decades following the repeal of prohibition in America, this once proud regional industry changed into an industry dominated by a few large brewers dominating the landscape. That story has been heavily covered, but the relevance of a breweries role as a national vs. local/regional economic force rears its head even among those in the craft beer arena today. Add in to the fact that this week’s featured brewing company is brand new and only has 1 style available for sale so far, and the debate is even more applicable. 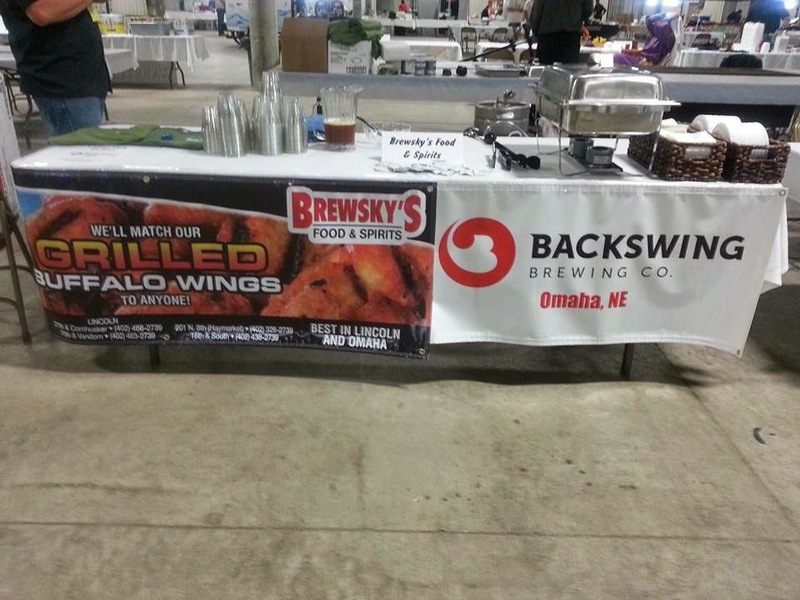 So let's say a hearty hello to Backswing Brewing Company, Nebraska’s newest brew to hit the market. 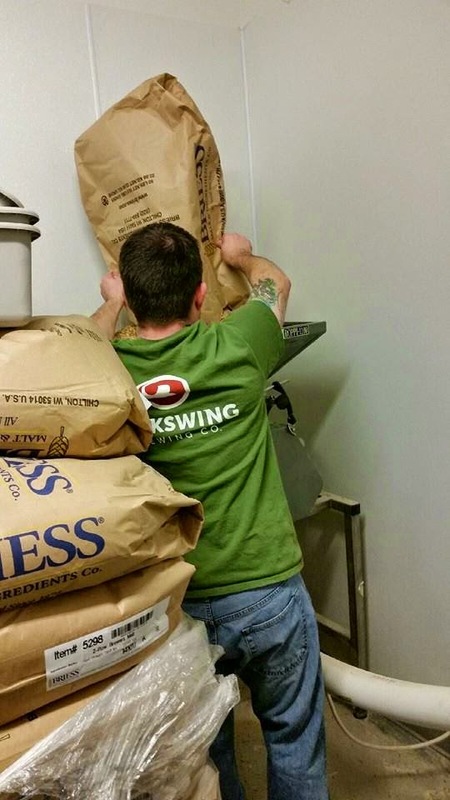 Backswing Brewing is the brainchild of 3 friends who have worked in the food and beverage industry for a combined 40 years. The friends decided to home brew for some fun and to make a mess in each others kitchens on a monthly basis about 5 years ago. One of these founding brewers is Pat Simpson, he was up for the second month of home brewing after a successful first month from other founder T.J. Walker. Pat took a mix of IPA recipes off the internet, blended them together and came up with what he calls a Midwest IPA. Blending the east with west the 3 were left with a feeling that this brew creation had some legs and started testing the taste buds of their friends. They were met with much approval and even received solid reviews from brewers at some local breweries. With this kind of praise they started...having kids and working at their jobs and the brewing stopped for these golfing brew buddies. Fast forward a few years and the idea of brewing beer surfaced again. The question was asked if this IPA that even friends who didn't like an IPA were raving about. The recipe was still dead on so the crew decided to purchase a 10/15 gallon system and take their creation to a crowd of folks who didn't have a clue who they were. At this point they lost the 3rd member of the crew but picked up new partner and brewer Cory Sinclair. After brewing a few batches in their new system and taking it to sample at Hops for Harmony in Omaha the rave reviews continued to pile up. Lincoln, NE brewers Blue Blood Brewing Company approached the team for a contract brewing opportunity so that the Backswing IPA could hit the market faster. And that's exactly what they did. The first batch is ready to go and will be distributed at Brewsky's Sports Pubs in Lincoln and Omaha in the coming weeks and will be featured at a launch party on Feb 13th at Brewsky's. The Backswing Team is also very excited to have their IPA on tap when buses swing through for Omaha Beer Week at the same location. So, how does this Midwest IPA taste? At 8.6% ABV and in the 80's for IBU it is a very hearty brew. The description of not leaning to either coast is true. This Midwest IPA has a strong hop character but it is truly not a bitter beer. There is a strong, almost sweet, malty caramel finish to the beer that drowns out any lingering hop. This is not a hop bomb. It is a flavorful IPA that is very drinkable. It's an exciting flagship brew from a company just trying to introduce themselves. For Nebraska this is a great thing. Though the number of breweries has increased, this is still a macro beer place. People on the fence about this whole craft beer thing settle for beers they see on commercials. For a state that idealizes its local beef and agro-history, when it comes to beer it has a long way to go and a huge marketplace for more local beer. When it comes to beer in general, regional flavors and local ideas should rule the landscape in my opinion. I am not against success, but in brewing sometimes large scale success kills innovation. There is plenty of room for guys like Pat, T.J., and Cory to not only be successful, but also to take the next step and open a standalone brewery as well. Up next for this new kid on the block is a host of recipes from American Wheat to Summer Ale. Around the country folks are getting together and coming up with creations just like Backswing, for the love of beer and a solid sip. When you come to Omaha for the beer week in February, or stop in to Brewsky's when visiting town make sure you have a Backswing IPA on tap and tip your cap to the guys who are helping to add more local to the market.